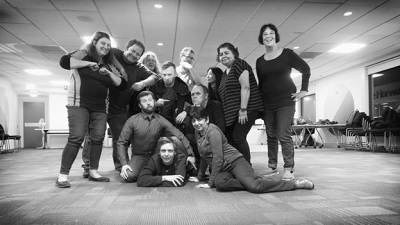 Discover your creative potential and enjoy improvising scenes and stories in a safe, positive group environment with the Wellington Improvisation Troupe [W.I.T.]. Improv is theatre without a script and a fun way to build your skills in many areas, including team work, public speaking, storytelling and on-your-feet creative thinking. This is the perfect place for absolute beginners to get acquainted with the joy and art of improvisation, inspired by the generous creative philosophy of Keith Johnstone. It's also a great place to get back into improv if you've been away from it for a while. W.I.T. has been teaching this course in association with the CEC for over 10 years now. It uses fun games and structured exercises to teach the foundation skills of improv. These are a prerequisite for further courses and membership of W.I.T. (www.wit.org.nz), as well as useful in themselves. If you have questions about the course, please contact W.I.T. directly on info@wit.org.nz. The course will end with a directed demonstration of class exercises for invited friends and family.